Kitchen time-saving tips for busy people! If you can think ahead when it comes to preparing meals –whether for the children, to eat together as a family, or for two invariably tired parents, then you have already won half the battle in the kitchen, I find. It’s taken a while, but I have learnt that cooking ‘stage by stage’ is a great way of helping me feel like I am (kind of) on top of things. By ‘stage by stage’ I mean using little windows of opportunity when the little ones are asleep/occupied in their high chair/at school to get ahead – so, for example washing and chopping vegetables in advance and storing in the fridge, or pre-roasting root veg to stir into a salad or pasta dish – this helps make prepping supper one-handed with baby on your hip a breeze! Being a spontaneous kind of girl, at first this notion of planning and doing meal prep in advance really went against the grain, but I have persevered, and now I find it an incredibly useful approach to cooking, especially given the hours I work, and the precious weekend time that I want to spend with the family. If you can get into the habit of being organized, planning meals, and cooking in stages you will feel calmer and more in control in the kitchen. You will also find you spend less time trying to rustle up meals on the fly and cooking when it’s reached ‘tipping point’, i.e. when the children are hungry and whiny, which can, let’s face it, be very stressful. And no-one likes to be stressed in the kitchen! Use the windows of opportunity available to you throughout the day to get ahead: prepare vegetables, make a white sauce, prepare the couscous – even just 5 minutes used well can help you cut down on cooking time later on. Keep a well-stocked store cupboard – this is one of the secrets to success in the kitchen. If you have a selection of ingredients to hand then you will always be able to prepare something quick, easy and interesting. Put aside some time to plan the week’s meals. Having an overview of who is eating what and when will help you plan the shopping and reduce waste. Don’t be afraid to take shortcuts if you are pressed for time and your week is going to be madly busy: no-one else is going to know (or likely care) if you buy ready-prepared vegetables. Don’t judge yourself either – do it and move on. Let me know your time-saving tips! 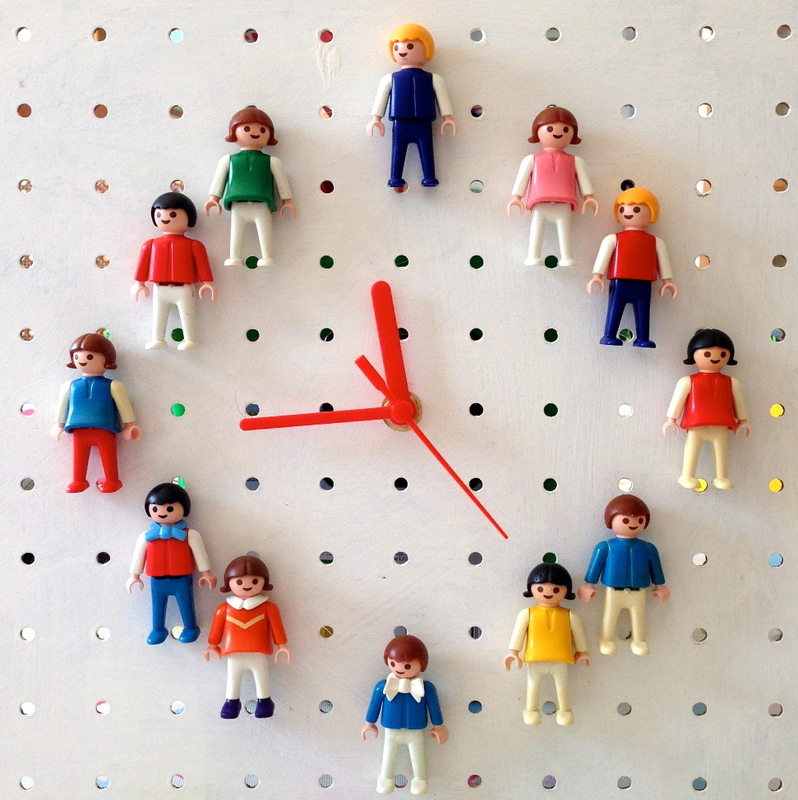 With special thanks to Jenny at The Gingerbread House for letting me reproduce her wonderful Playmobil clock photo to illustrate this post! I recently met someone whose baby wasn’t that keen on meat, and she was struggling to find alternatives for main meals. It got me thinking about lentils, and how good they are for you, and about meat-free alternatives to popular winter warmer dishes. I also feel as though we need some meat-free options post Christmas, which was heavy on meat. Lentils contain lots of protein, as well as valuable amounts of B vitamins, plus iron, zinc and calcium. They are also a good source of fibre. And they’re cheap. What’s not to like? In my Meat-free Moussaka I use good old tinned lentils (in this case, Waitrose Essentials Tinned Lentils), which cost 69p a tin. The dish also contains child-friendly tomato sauce, cheese sauce and potatoes, so hopefully the lentils, which older ones may be unsure about, won’t look too ‘strange’. If they’ve never tried aubergine, give it a whirl. My 3-year-old astonished me by devouring an entire plateful the first time I made this; no complaints. Each component can be made and chilled overnight if needs be. You can even assemble all 4 components into the finished dish and then chill that overnight ready for baking the next day, too (but get it out the fridge and bring it to room temperature before baking). The end result is really delicious and will keep the whole family happy. If you want to try it on your baby, I suggest making a separate mini moussaka with the tomato–lentil sauce blended up (to make the lentils more digestsible) and omitting the aubergine, so you just layer blended tomato–lentil sauce, cooked potato and cheesy sauce. Lots of moussaka recipes require you to fry the aubergine in oil, but I like to keep things simple! Simply line a large baking tray with foil, brush it with olive oil and arrange the sliced aubergines, then brush them generously with oil and bake at 200˚C/180˚C Fan/ 400˚F for 15 mins. Put to one side. As I said, it’s fine to let them completely cool and come back to them later when you assemble the dish. Make a thick tomato sauce as follows: sweat the onions and garlic in 2tbsp olive oil for about 10 minutes, before adding a good squeeze of tomato puree, and the chopped tomatoes. Simmer gently for around 10–15 minutes, and then add the tinned lentils (which have been drained and rinsed). Simmer for a further 10 minutes or so until the sauce thickens. If it looks a bit too thick, add a bit of water. Put to one side. This sauce can be cooled and refrigerated overnight. Wash and slice the potatoes (there’s no need to peel them!) into slices about the thickness of a pound coin. Add to a saucepan and cover with cold water. Bring to the boil and simmer for approx. 4 minutes, until fairly soft. 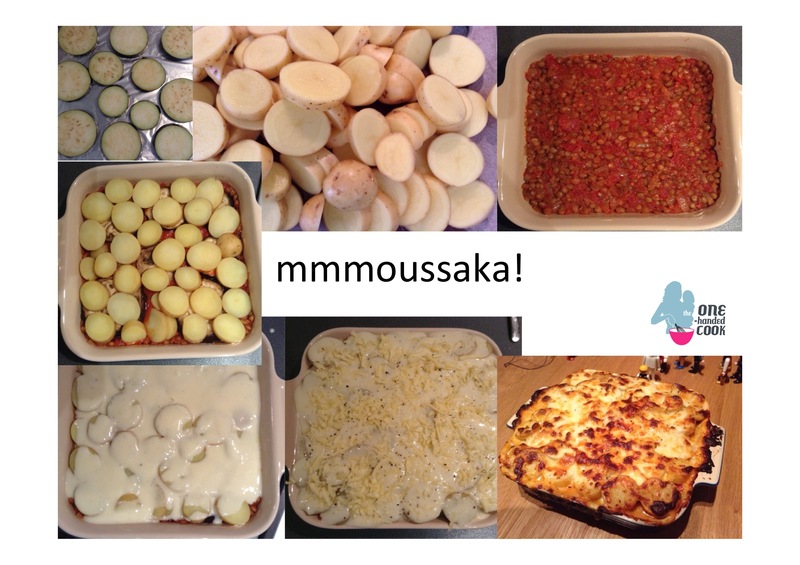 Again, lots of moussaka recipes say boil the potatoes and then slice them, which is a total nightmare as they are a) hot and b) crumbly. This method works a treat! Drain and put to one side. A cheese sauce is the first thing my mum ever taught me to make, as a teenager, and I still follow her method today. It will remain engrained in my brain forever. Melt the butter in a high-sided saucepan (I use a Stellar 7000 sauce pot; it may sound terribly pretentious but it’s specially designed for making sauces, and never lets me down! ), add the cornflour to make a roux, stirring all the time, then add the milk (if you have the wherewithal, pre-heat the milk in the microwave for a minute and a half), stirring continually to prevent lumps from forming. Add a grating of nutmeg and seasoning, and keep stirring until the sauce starts to thicken and bubble. Then turn down the heat and cook for a minute or two. Remove from the heat and stir in your grated Cheddar. Put to one side. Pre-heat oven to 200˚C/180˚C Fan/ 400˚F. Take a largeish gratin dish (mine is 9” x 9”) – the aim is to have two layers of everything, finishing with a layer of sauce, topped with grated cheese. Start with half the tomato–lentil sauce, then half the aubergines, then half the potatoes, then half the sauce. Repeat. Top with the cheese and a twist or two of black pepper and bake for approx. 35–40 minutes until golden. Good served with courgettes sautéd in butter or a green salad. The assembling of the moussaka! I know I am a bit late for Shrove Tuesday, but then, given I usually have two kids in tow, I am often late for a lot of things… Anyway, today I bring you pancakes. Who doesn’t love a pancake? Warm from the frying pan, with a squeeze of lemon and a sprinkling of sugar, they are manna from heaven. When I went travelling in Thailand many moons ago (pre-children) banana pancakes made in tiny little pans over a gas flame in the street became almost a daily staple for body and soul – served, as they were, with a swirl of chocolate sauce and a beaming smile. I was lucky enough to be sent a Pancake Kit by the lovely people at Oxo Good Grips, who produce fantastic kitchen tools, it has to be said. My kit comprised an Oxo Good Grips batter bowl, an Oxo Good Grips Silicone Balloon Whisk and an Oxo Good Grips Silicone Flexible Pancake Turner. I was particularly excited about the batter bowl, because one of the things that is tricky to do one-handed in the kitchen, while holding baby in one hand, is stir something in a bowl because invariably the bowl will move. Not with this bad boy. It has a non-skid base to stabilize the bowl when mixing. Genius. Now, Oxo may not have designed this bowl with the one-handed cook in mind, but boy, is this one-handed cook happy about it! I made my pancake batter – see below for recipe – using my lovely batter bowl and gave it the one-handed test, with my whisk in my right hand and, not a baby this time I confess, but a cup of coffee in my left. This is how I did it: I put the batter bowl on my platform scale and weighed the flour straight into it, put it back on the kitchen worktop then added the pre-cracked egg and the extra yolk, the pre-melted butter, a pinch of salt, started whisking, and then added the milk bit by bit until I’d made my lovely mixture. The bowl holds 2 litres, and has high sides, making it splatter-proof, too – very handy. The handle makes it comfortable to hold, and it has a wide lip for easy pouring. I can see this becoming my go-to mixing bowl for cakes. As you can see from my One-Handed Cook logo, I am a big fan of the whisk! The Oxo Good Grips balloon whisk is also a lovely thing to use – for me, what makes it different is the fact that the handle is shorter than most, which actually gives you better control, and the rubbery handle feels really nice and doesn’t slip out of your hand (hence the ‘good grip’ bit – keep up). I also love it because it’s red, and if you know me, you’ll know I like a colourful kitchen gadget. The pancake turner is super-flexible and very thin, so perfect for turning not just pancakes, but anything really, because it’s large and helps prevent things falling apart – you could use for omelettes, fish, burgers etc. Finally, the other good thing about all these Oxo Good Grips items is that they all go in the dishwasher once you’ve finished. Result. Make the pancake batter at least half an hour in advance of cooking, and then they can be cooked one-handed at tea-time, I promise. I know, I’ve done it. Note that the first pancake often goes a bit wrong, but once you find a rhythm and your pan’s nice and hot these are a cinch to make. Plus the mixture will keep, covered, overnight in the fridge – more for breakfast! Yum. 1. Put all the ingredients bar the milk into your bowl and whisk together with a balloon whisk. Gradually add the milk, whisking as you go. Pour through a sieve into a jug and leave to stand, as above. 2. Using a 15-20cm frying pan, heat a small knob of butter on a high-ish heat, and once it’s sizzling hot, add a small ladleful of batter mixture to just cover the base of the pan. ‘Swoosh’ it round the pan by picking it up and moving it around. 3. Use a pancake turner to lift the mixture away from the edge of the pan a little and once the edges turn pale brown (after 30-60 seconds), use it to flip the pancake over and cook for a further 30-60 seconds. 4. Tip out onto a plate or some greaseproof paper. 5. Serve with lemon juice and sugar. Or sliced banana and Nutella. Or squeezy honey and blueberries with Greek yogurt. Or whatever takes your fancy! These are absolutely yummy and take me back to my own childhood. Grate some cheddar cheese and chop two slices of decent-quality ham. Once you’ve flipped over your pancake, add the cheese and ham mixture to the middle, in a line, and fold the two sides in and over the mixture. Cook for about 30 seconds and then flip the folded pancake back over for a few more seconds, to ensure the cheese is well and truly melted. Serve. Disclaimer: I was sent the Oxo Good Grips Pancake Kit as a gift to test. All opinions are my own. What a week. I’ve been poorly, both kids have been poorly. Work has been missed. School has been missed. Appetites have been lost. It’s all been a bit topsy turvy, so it was a relief to get back to normal this weekend and do some cooking and baking. Lovely husband bought me Annie Bell’s Baking Bible – woah, now there’s a baking book and a half. I loved it from the moment I saw it, and chose to make Blueberry and Orange Muffins, which were delish, and look, I even managed to find the recipe for you here. I have long been a fan of Annie Bell and this is a super book for the home baker. Today we caught up with old friends who live out in the countryside, which was lovely. It’s always nice to have a breather from London. Seeing our five (between us) children playing and growing up together is a joy. Seeing my friend’s large and well-stocked larder, however, is not a joy as I am proper jealous. 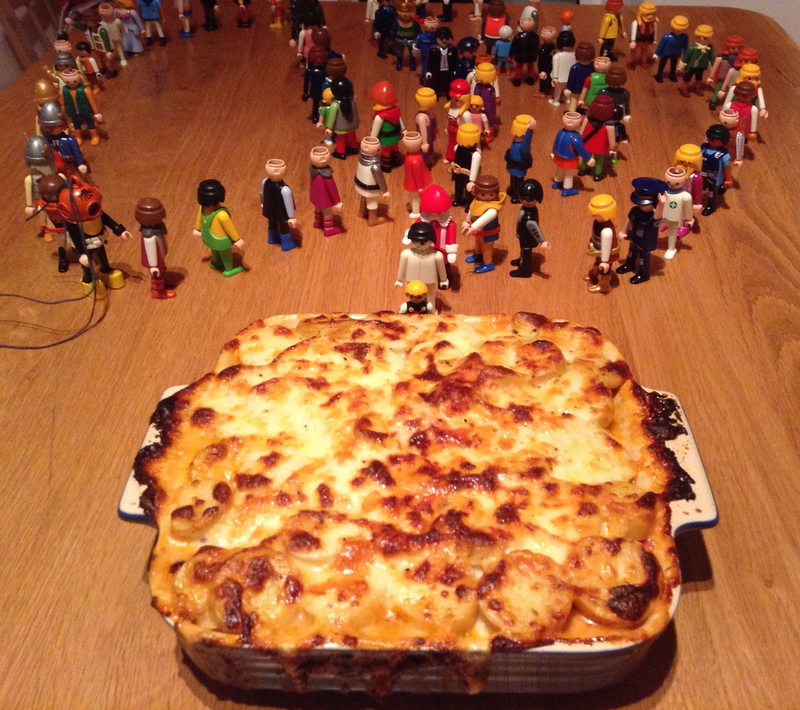 One of the things busy parents are always on the lookout for are simple pasta dishes for a family meal. We are all huge fans of macaroni cheese, but I started thinking about how it could be tweaked, plus made a bit simpler without having to make a white sauce each time, which can be a faff if you’re just trying to get Dinner On The Table. 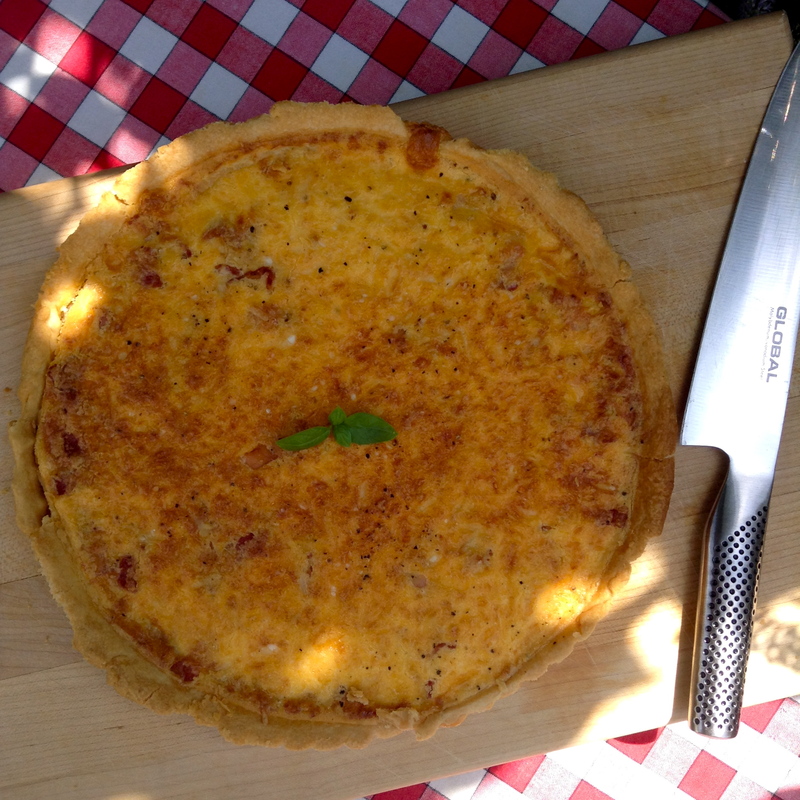 This recipe just uses crème fraîche – use half-fat if you like – and works a treat. This rather moreish pasta dish, which you could also make using penne, rigatoni (or whatever really) is a great dish for a Monday night after a roast chicken on a Sunday, because you can use leftover cooked chicken. Which we like. Note that stages 1 and 2 could be done in advance and left to rest (refrigerate the chicken once it’s cool if necessary) until you are ready to make the whole dish. I’m a big fan of stage-by-stage cooking, and using the windows of time available while the children are occupied, as you know! Cook the macaroni or other pasta according to the instructions on the packet. Once cooked, drain and set aside. Meanwhile, if you need to cook the meat from scratch, slice each chicken breast into smallish pieces (bite-size for kids), heat a griddle pan or frying pan, add a dash of olive oil and sauté until cooked through. Set aside. Put the crème fraîche into a non-stick saucepan and set over a gentle heat. Add the rosemary and garlic, stir, and bring to a simmer. Add the cooked chicken and the cheese and season (go gently if serving to toddlers). Remove the pan from the heat and add the cooked pasta, stirring it together well. Pour into an ovenproof dish, top with a bit more grated cheese (you could also add some ready-made breadcrumbs if you have some, or scatter on a bit more chopped rosemary) and bake for 18-20 minutes until golden and bubbling. Nice served with green beans. Look what Santa’s got in his sleigh! It wouldn’t be a party in our house without these biscuits. They are perfect with a glass of white wine (or two) and just the thing for any Christmas do. I make a batch whenever we are entertaining, be it a grown-up party or a kids’ one – they are universally adored. They are deliciously cheesy and savoury, and the semolina lends them a fine crisp texture and extra bite. They are so easy to make, that once you’ve got your ingredients together all you really need to be capable of doing is pressing the button on your food processor. Ta da! Warning – they are melt-in-the-mouth delicious and very moreish. Preheat oven to 180˚C (160˚C Fan). Use the grater function on your food processor to grate the parmesan (takes seconds). Add the rest of the ingredients, except the nuts, to the food processor. Work together until combined to a soft dough. Remove the dough, and roll into a big ball. Roll the dough into small balls about 3–4cm in diameter and flatten each ball between the palms of your hands. (They are quite rich, so I usually make them smaller rather than larger.) Lay each biscuit on a greased baking tray. Top each biscuit with a pistachio nut. Walnut pieces, peanuts pinenuts and poppy seeds work really well, too. Bake in the pre-heated oven for approx. 12 minutes until pale golden brown. Keep an eye on them – you don’t want them to burn. Cool on a wire rack and serve cold. Try not to eat the lot before your guests arrive. Preparing ahead: they freeze brilliantly, just defrost them – you don’t even need to reheat them or anything. They can also be made up to a week in advance and kept in airtight container. Alternatively, make the dough in advance, freeze it, defrost it overnight in the fridge and make them when it suits you. On Monday night I was invited to an event by foodie campaigners Slow Food UK. They are on a mission to preserve our food heritage, and one of their aims is to encourage people to cook so-called ‘forgotten foods’. They invited chef Anna Hansen from London restaurant The Modern Pantry to come and cook with some of these foods, including quince and einkorn flour, to show us how it’s done. I have eaten at Anna’s restaurant and have her rather wonderful cookbook, too. But seeing her cook in real life, and talk about how she approaches flavours and ingredients was inspirational. Her trademark style is to combine flavours from the ‘global larder’, so – rather than saying that wasabi is Japanese, and can therefore only go with Japanese food, for example, she thinks carefully about how individual flavours combine, and might add wasabi to a dish that we think of as being typically French, with surprising and delicious results – and trust me, I have tasted her food, it’s amazing. At the demo she cooked a wonderful-smelling and delicious lamb dish, and used the most incredible array of herbs and spices, and I came home to my kitchen keen to try using spices with a renewed vigour. So, I was going to make lemon shortbread for you this week, but inspired by Anna Hansen, I bring you Orange Cardamom Shortbread, which is completely lovely (and actually quite addictive! ), and the children and I have already devoured much of the shortbread Jenga you see before you. Good food is not a game! I’d like to start by saying that shortbread is Very Easy To Make, so perfect for the one-handed cook, who may be trying to do several other things at the same time while also trying to make shortbread (ring any bells?). 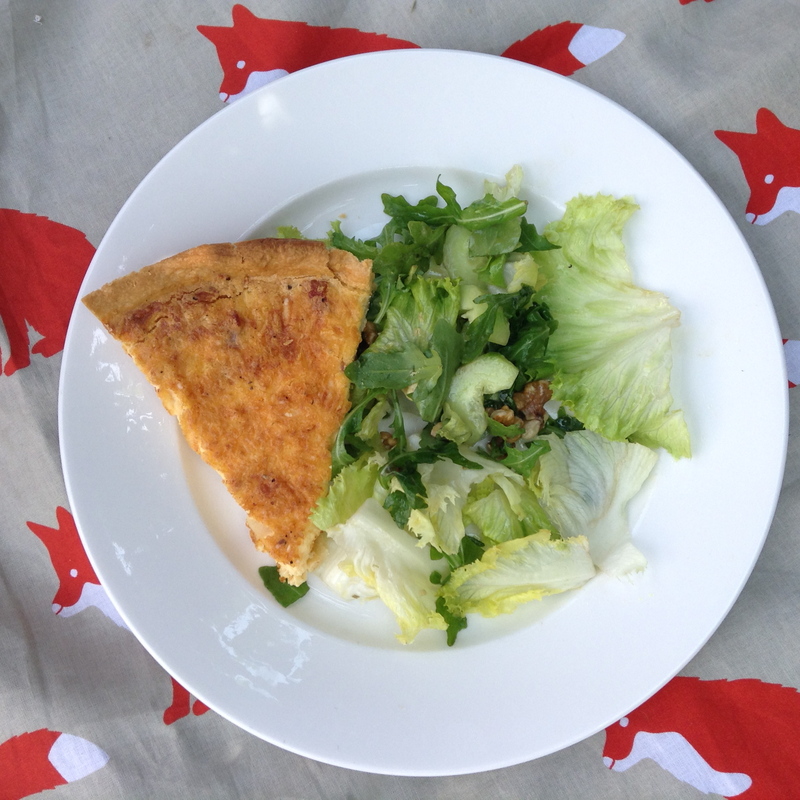 Or if you have a window of time while the little one is happily watching Peppa Pig, say, this is very quick to whip up. Perfect for a bake sale, a coffee morning, for you, for your granny, hell, you could even wrap some in greaseproof paper then wrap in some pretty fabric with a bit of ribbon and give it as a Christmas present. You need a hand mixer and a baking tin measuring approx. 8” x 8” x 1½” – assuming you have these, you can get this made and in the oven in about 10 minutes – I kid you not. Heat the oven to 170°C/150°C Fan/325°F. Grease and line your baking tin (or use Cake Release by Lakeland if you can’t be bothered with the faff). Cream together the butter, sugar and orange zest in a large mixing bowl until light and fluffy. Gradually stir in the flour and the ground cardamom seeds until your mixture is light and crumbly. Tip mixture into baking tin. Use your fingers to press the mixture into the tin and then the palms of your hands to smooth the top. Mark out fingers with a sharp knife, but don’t cut right through. Prick each finger a couple of times with a fork. If you have the time and the inclination, you can brush each finger with a little beaten egg and sprinkle more caster sugar on top before baking in the oven for 25–30 mins. Cool in the tin on a rack. Leave Peppa Pig DVD playing, sit down and enjoy with a nice cup of tea.